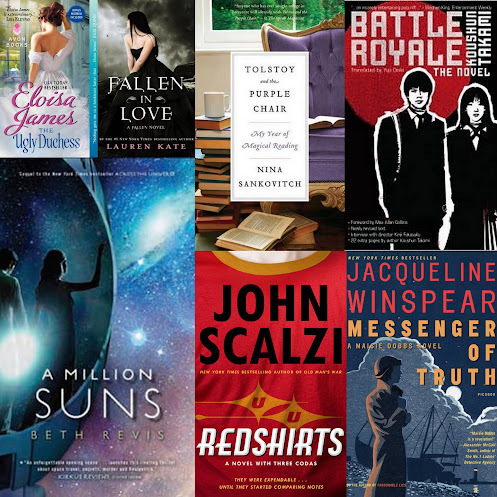 TSS: September 2012 Recap – my books. my life. I owe you all an apology. I have really let the blog go this month. I posted only 4 reviews (one for a book I didn’t even finish) and only 1 other Sunday Salon (gone are those leisurely Sunday mornings where I could whip one up last minute). I will try to be a little more organized in October and actually review some books for you. I feel like I barely read anything in September, but looking back, I managed to finish 7 books. So I suppose I did a little better with the reading than I did with the blogging. My favorite this month was probably A Million Suns. But Redshirts is a close second. It’s hard to believe Evan is four months old. But he is. And still just an incredibly happy baby. He’s reaching and grabbing, trying to sit up, and sleeping 6-8 hours in one go at night. We’ve gotten into a good work/daycare routine. Our next great adventure is cloth diapering – I’m giving it a trial run in October. I am still participating in Fat Mum Slim’s Photo-a-Day challenge. Head over to my tumblr to see the September pics. Next Article Hello October. Hello Old Books. I didn’t manage a full seven books, but I was a much more consistent reader than blogger in September, too. I can’t seem to work out the balance. It’s either mostly reading or mostly blogging! I was ALSO much better with reading than blogging in September. Part of it was that the writing time I *did* have went to freelance stuff, but it is so much easier to read with little babies than to write with them. That changes when they’re moving more, in my experience. Still, the fact that I read a ton and didn’t write much has me crazy-behind on reviews. Okay, actually I’m getting back on a reading roll and am cruising now with my reading…holding steady with my blogging, but nothing that is amaze-balls or anything. What did you think of the Maisie Dobbs? I want to get back to the series at some point and am just wondering what you thought, in brief. I didn’t enjoy this last Maisie Dobbs book as much as I’ve enjoyed the others. But I still like the series a lot. I am amazed you can blog at all!! Seriously having a child is a major life change and time consuming and wonderful. Books and blogs will always be there, Evan will only be an infant once….so enjoy it all. I am very impressed. My baby is 4 months old today (!) and I read only 3 books in September. My worst month in recent memory. My best friend once posted a picture of her baby wearing the same onesie mine was wearing that day. I guess we all have the same stuff.